A map, completed with commentaries and images is perfect for transmitting information beyond topography. Caspinianus, by publishing the map, drew attention to the dangers the Ottoman Empire posed to this area in the 16th century, and subtly warned the Holy Roman Empire of its unique responsibilities arising because of this situation. Among the European rulers, only the Holy Roman Emperor had enough authority and resources to defend the Christian world from these Pagans. Caspinianus has visited the Hungarian royal court several times. In 1526, year of the Battle of Mohács, he published an “encouraging speech” (Oratio), which warned Europe about the approaching dangers. On the Tabula Hungariae, he had certain events depicted that had an open political message not only for Hungarians, but also for the Holy Roman Empire. 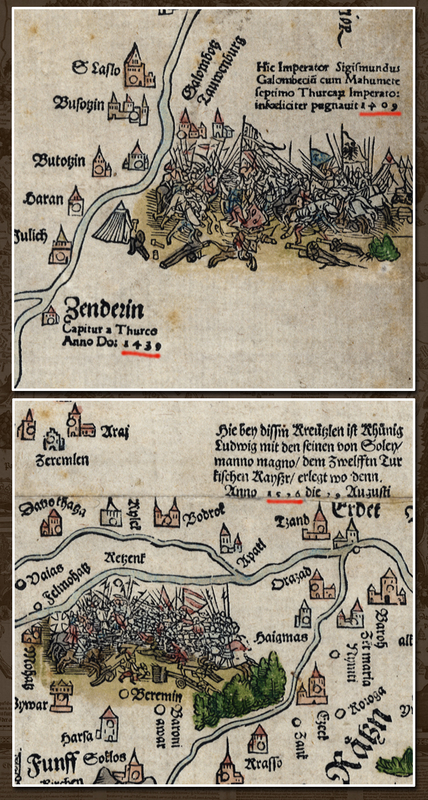 (Galambóc, 1428 – on the map, it is written as 1409 by mistake; Szendrő, 1439 and Mohács, 1526) Therefore the Tabula Hungariae was similar to fliers of the middle age. This exclamation of important battles can also be interpreted as a subtle sign that refers to the shared responsibility of stopping the Ottomans. Presumably, as we may experience it today, people living “far from the fire” were not afraid of being burnt. Probably Caspinianus’ target audience didn’t think of the Ottoman Empire as a threat to themselves. Connected to the map’s background we have to mention two sources. These two works of different genres both present the pre-Mohács Hungary as a country blessed with natural and economical resources. One is Bálint Hagymási’s poem, Ad Pannoniam, written in Latin in 1509, the other is Miklós Oláh’s writing from 1536, Hungaria.